Akhenaten, also Akhenaton, Ikhnaton, or Amenhotep IV, was pharaoh of Egypt from 1352 - 1336 B.C. a member of the Eighteenth dynasty. He led a religious revolution, rejected the traditional gods of Egypt, and worshiped the disk of the Sun, which he called Aten. He moved the capital from Thebes to Akhenaten (modern Amarna) to escape the influence of the priests of Amun. Statues of him show an artistic form new in Egypt, including various deformities which have led some scholars to conclude he had some kind of deformity or genetic disease. A thorough examination of the royal mummies did not uncover evidence of unusual diseases or deformities, so the depictions are most likely an artistic style. The earliest Egyptian gods were nature gods. Such gods were typically associated with a particular city or other locality. With the rise of the pharaonic state, these gods were organized into a pantheon headed by a chief god, analogous to the structure of the royal court. Thutmose III (r. 1479-1425 B.C.) invaded Palestine, Syria, and Iraq. These wars had exposed Egyptians, particularly those who had served in the army, to a variety of practices and views concerning religion. Each nation, it was learned, had its own gods. But the Sun was everywhere. Faced with the overmighty Amun cult, a succession of pharaohs promoted Atenism. Thutmosis IV (r. 1400-1390) proclaimed Aten the protector of the army. Instead of waiting for death, Amenhotep III (r. 1390-1352), Akhenaten's father, impatiently proclaimed himself a god while he was still alive. The powers of a universal god transcended national boundaries, just as pharaoh's authority now stretched across nations. "In the ancient East, monotheism was but imperialism in religion," wrote Egyptologist James Breasted. Akhenaten's reforms were also an attempt to return to the past. In the Old Kingdom, Re, the god of the noonday Sun, and Horus, a falcon god, were the dominant cults. They did not respond to the prayers of commoners, but only to the pharaoh, which was divine and his power absolute. Commoners had no future in the afterworld. They volunteered to build pyramids so that pharaoh could have an afterlife and continue to watch over them after he died. In the New Kingdom, religion was more democratic. The afterlife rites earlier practiced only by pharaohs became widespread. Egyptians developed relationships with the gods through a variety of cults and temples. Akhenaten began his revolution by enclosing the name of Aten in a cartouche identical to his own. Aten would be a pharaoh among the gods. Iconoclasts hacked the word "gods" out of monuments and inscriptions. The capital was moved from Thebes to Amarna, a previously uninhabited location that was uncontaminated by association with any of the old gods. The enormous architectural projects of this era featured the use of talatat, smaller stones of uniform size that allowed construction to proceed more rapidly. Unlike the pyramids, which are constructed of huge stones, Akhenaten's projects were later taken apart, the talatat reused in other projects. A bust of Nefertiti now in the Ägyptisches Museum in Berlin has made Akhenaten's beautiful primary wife one of the best-known Egyptian queens. In Akhenaten's declining years, she served as "effective for her husband" (regent) with the reign name Nerferneferuatan. In a few late inscriptions, she is described as "Akhenaten-less." This implies that she continued to rule after Akhenaten's death, at least for a brief period. Nerferneferuatan's reign was followed by that of Smenkhkare, a brother of Akhenaten. Within a year of Akhenaten's death, both Nerferneferuatan and Smenkhkare disappeared from the records. Tutankhamun, a boy of 10 or 11 at this time, ascended to the throne. Real power in this period may have been held by Ay, a vizier appointed by Akhenaten. 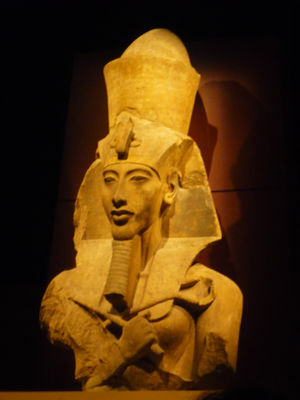 Tut reversed many of Akenaten's policies. Egypt reverted to polytheism and the priests of Amun regained power. Akhenaten, Nerferneferuatan, Smenkhkare, and Tut are omitted from the Abydos king list. This suggests that they were viewed as illegitimate rulers by the following 19th dynasty. An inscription from the reign of Ramses II denounces Akhenaten as, "that criminal from Akhetaten." In 2010, genetic testing established that mummy KV55 is both a son of Amenhotep III and Tut's father. An inscription in Tut's tomb identifies him as the son of a pharaoh, so the mummy must be either Akhenaten or Smenkhkare. Numerous portrayals of Akhenaten's family have survived, but none of these include Tut. Akhenaten is depicted as having relations with his daughters as soon as they came of age (13 in ancient Egypt). That Akhenaten named Nefertiti as his successor implies that these well-advertised efforts to produce a male heir of pure royal blood were not successful. ↑ 2.0 2.1 Breasted, James, "Ikhnaton"
↑ Akhenaten, "The Great Hymn to Aten"
↑ 4.0 4.1 4.2 4.3 Allen, James, "The Amarna Succession, Causing His Name to Live: Studies in Egyptian Epigraphy and History in Memory of William J. Murnane, University of Memphis, 2007. ↑ "Lost Pharaoh Akhenaten Found After Further DNA Testing Of Tutankhamun"
↑ Phizackerley, Kate, "DNA Shows that KV55 Mummy Probably Not Akhenaten"
This page was last modified on 30 June 2016, at 19:34.